The spy agency at the center of Marvel's Agents of S.H.I.E.L.D. is celebrating its 50th anniversary, and Marvel has been releasing a series of one-shot comics featuring some of the show's popular female characters—most of whom have appeared in the comics before—including Agent Carter's Peggy Carter and S.H.I.E.L.D. 's Bobbi Morse and Daisy Johnson (formerly known as Skye). The latest to get her own comic treatment is none other than fan favorite Melinda May. 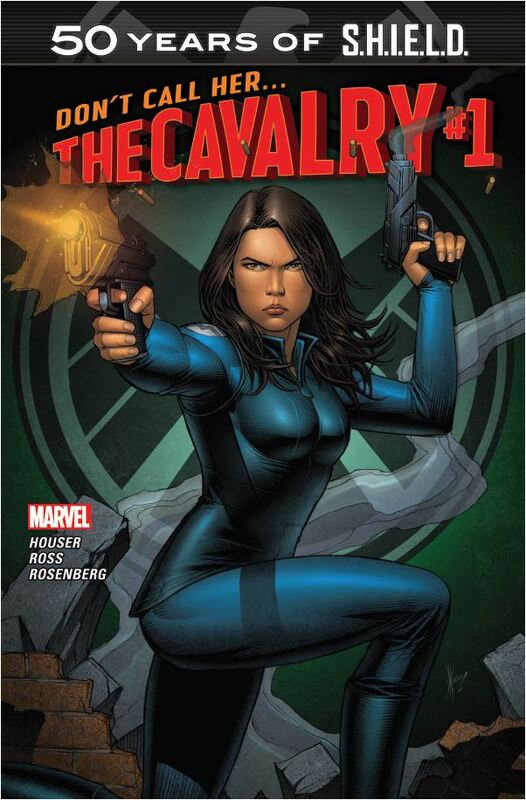 On the show, May is better known in the agency as "The Cavalry," so it doesn't come as too much of a surprise that the first comic to feature her would use her nickname as the title. To celebrate May's moment in the spotlight, we caught up with writer Jody Houser to talk about writing a Melinda May comic, cyber-wolves and Agents of S.H.I.E.L.D. Easter eggs. Plus: Get a sneak peek of some pages from the comic book after the interview below! Agents of S.H.I.E.L.D. viewers have gotten to know Melinda May over two seasons, but she hasn't been the star of her comic until now. How did you go about nailing the tone and feel of a Melinda May comic? Agent May in the comics universe isn't the exact same character on Marvel's Agents of S.H.I.E.L.D., but she is very recognizable to anyone who's familiar with the show. This version of May has just been shaped by a universe that's a bit larger and weirder than the Marvel Cinematic Universe. My goal for the comic was to showcase the badass agent we all know and love, dealing with the sort of crazy threat you would really only see in a comic book. We get to see May train new recruits in the comic. What is her relationship with them like? Unlike in the show, where May started training Skye on-the-job after they'd worked together for a while, the S.H.I.E.L.D. 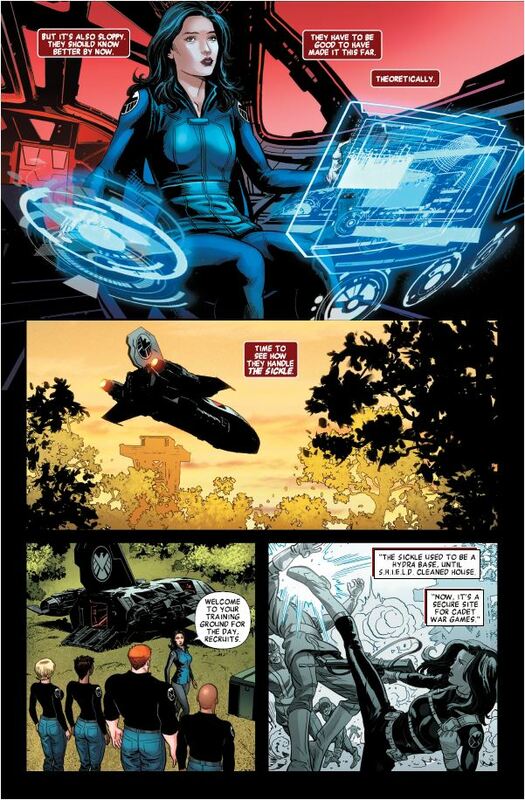 cadets in the comic are out training with her for the first time, within the structure of the academy courses. They're one of the many groups of cadets that she's worked with, so there really isn't a close relationship and a trust in place that she had built up with Skye. How would you describe these recruits? The S.H.I.E.L.D. cadets are very much still in the midst of their training. They're very good at what they do, but they lack experience, a huge contrast to a seasoned agent like May. All the cadets know about her are the rumors they've heard whispered here and there since they started at the academy. Because of that, they're juuuuust a bit intimidated. Last season the show revealed some of May’s backstory—namely why she’s called “The Cavalry.” Will we see some more in the comic? The comic touches on the events that led to her nickname, but the focus is more on how that tragedy and other experiences in her long career as an agent shaped the woman she is today, and how others see her. In both universes, May keeps her cards close to her chest, so seeing how her past translates into present action is one of the best ways to understand her. The comic description mentions “Cyber-wolves.” What can you reveal about them? Everyone keeps asking about the Cyber-wolves! They're pretty much what happens when someone who read superhero comics as a kid in the nineties grew up to write them. Also they're a cybernetic wolf pack. Will there be any Easter eggs or surprises for regular TV show viewers in the comic? There are definitely some Easter eggs for both viewers of the show and fans of the brilliant Ming-Na Wen. Some are easier to spot than others, so readers should keep an eye out! What was your favorite part about writing for May? Aside from being an awesome character, the excitement from fans (including Ming-Na Wen herself!) has been wonderful to see. There's something special about characters who have enough of a following to successfully transition mediums, and being a part of establishing who May is in the Marvel comics universe is really an honor. What are you most excited for fans to read? The issue as a whole, really. It's my first time writing a full issue for Marvel, and it's actually my first published solo-written issue. As someone who grew up loving superheroes, getting to write a little piece of the Marvel universe is amazing. What was it like working with artist Luke Ross? What does he bring to the comic? Both Luke and colorist Rachelle Rosenberg have much more experience working in the Marvel universe than I do, so they were the key to making sure the book really felt like it was a part of the larger story of that world. Although this issue was written to be accessible to fans of the show, it does take place in the comic book continuity, so having veteran collaborators was a real blessing. I'm writing Max Flight: Ultimate Ride for Marvel, adapted from the James Patterson series. The first issue hits stores in November. The Cavalry: S.H.I.E.L.D. 50th Anniversary comic is out in stores right now, with a digital version available for purchase on Marvel.com.